Tom SenGupta Forums focus on bringing forth new understanding of topics that are essential to positive growth of society. We encourage egalitarian participation and learning among inter-generational groups with diverse experiences and talents. Take a break from the office and enjoy some good food and fellowship! Music provided by Augsburg Jazz. Augsburg's strong Norwegian heritage shows, especially during the holiday season. Once again, it is time for the traditional Scandinavian Velkommen Jul celebration hosted by the Augsburg Associates on Dec. 5, starting with Chapel service at 10:20 a.m. and moving to the Christensen Center from 11 a.m. to 2 p.m.
Velkommen Jul is an annual Christmas celebration you don't want to miss. 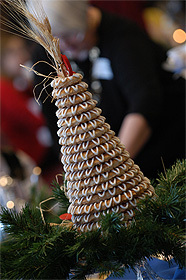 The event will feature Scandinavian Yuletide music, tasty treats including krumkake and the ever-popular yet odious lutefisk, handcrafted items, Norwegian bunads, and a visit from St. Nicholas during chapel. The Augsburg College Associates, who number around 100, are a service auxiliary of volunteers whose mission includes fundraising for special projects and scholarships in support of Augsburg College. In the nearly 20 years since their founding, the Associates have given to Augsburg more than a half million dollars from their fundraising. They host Velkommen Jul as a service to the Augsburg community and as a way to celebrate its Norwegian heritage.